Chocolate for breakfast? 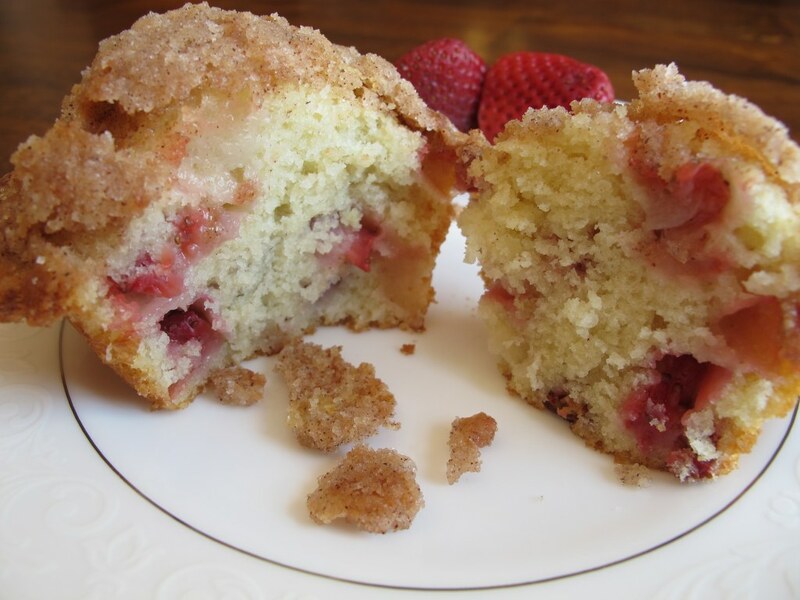 Yes, but don’t panic because these muffins are low in fat and calories! Finally, a tasty muffin that I can eat and not feel guilty about it. 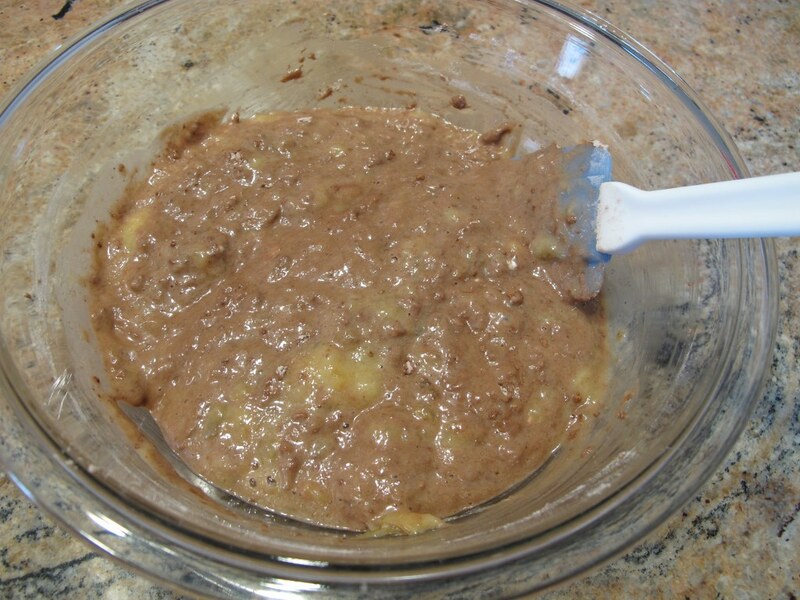 In a large bowl, whisk together the flour, cocoa, baking powder, baking soda, cinnamon, and salt. Set the bowl with the dry ingredients aside. 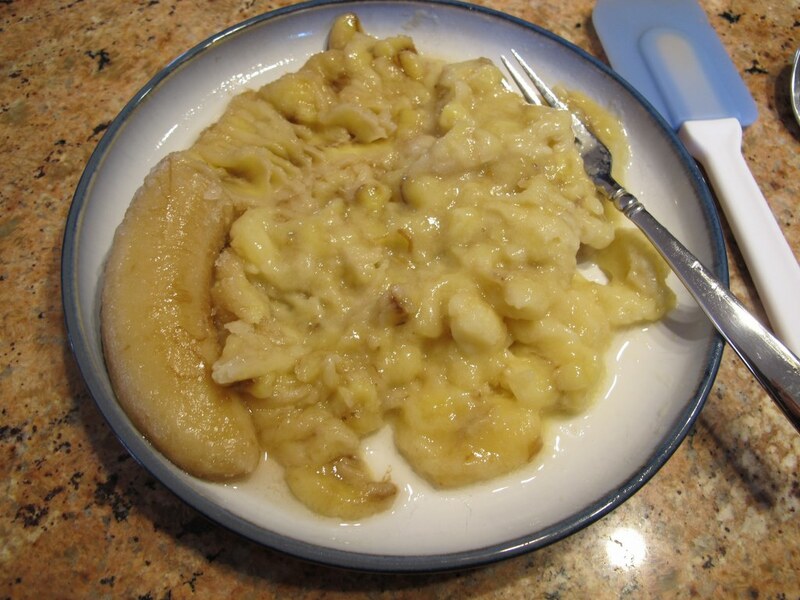 In a medium bowl, mix together the buttermilk, egg, honey, oil, vanilla, and bananas. Add the wet ingredients to the dry ingredients and use a spatula to stir just until the dry ingredients are moist. Add 4 tablespoons of the mini semi-sweet chocolate chips and gently fold them into the batter. Place paper liners into 12 cups of a standard sized muffin pan (or grease the cups of the muffin pan) then scoop the batter evenly into them. Sprinkle the 2 remaining tablespoons of mini semi-sweet chocolate chips evenly over each muffin. Bake the muffins in the preheated oven for about 15 minutes or until a tester inserted in the center comes out clean. Store the muffins in an air tight container on the counter or wrap them up individually in plastic wrap, place them in a freezer friendly bag, and freeze them for up to 2 to 3 months. The bananas must definitely be ripe. Are they gross looking? Are they mushy? If yes, then you’re good to go! 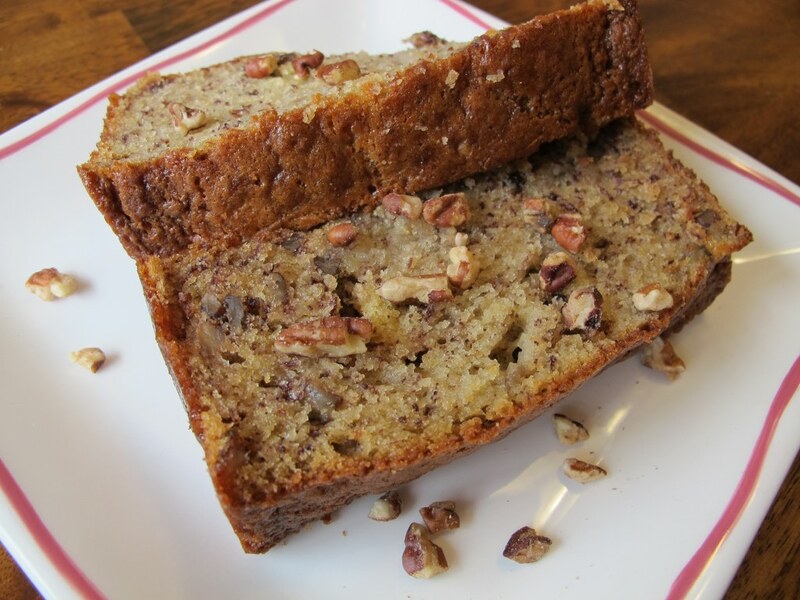 If you use bananas that aren’t ripe enough then your muffins (or any other goodie that you bake using bananas) may come out bland or with a weird texture. There is no butter in these muffins and that’s good in order to cut down on the fat and calories. You still want to have ingredients that contain some fat because without it the muffins will come out dry. These muffins have very little oil, low fat buttermilk, and bananas, all which make these low fat breakfast goodies extra moist. There is no white or brown sugar in these muffins and you could have fooled me because they are perfectly sweet. Honey is a great alternate ingredient to use here to achieve that sweetness, in place of sugar. Baking Tip: Do not over mix when you add the wet ingredients to the dry ingredients. If you over mix then you will likely end up with tough muffins. You simply need to mix just until the dry ingredients are moist. Some lumps in the muffin batter are okay and will bake out. I am in love with these miniature chocolate chips! They are adorable! They are so small but they pack a good punch of chocolate flavor. 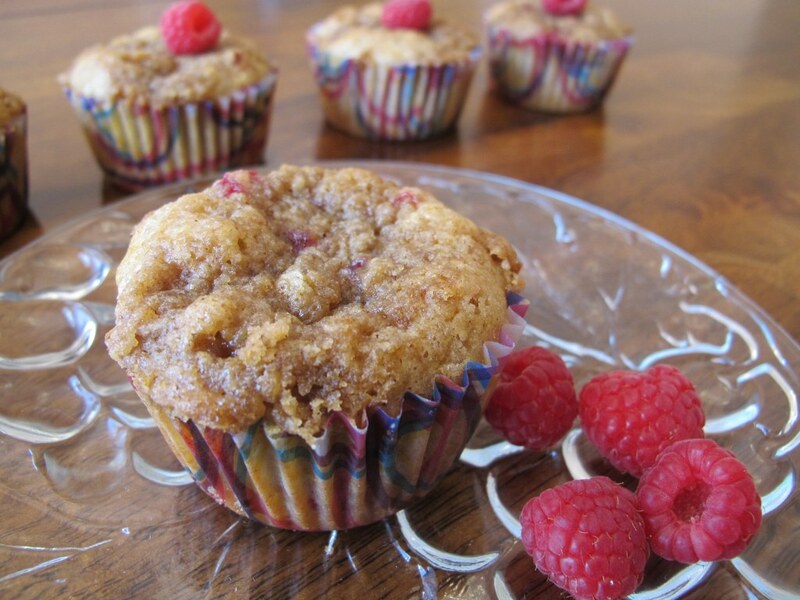 A little bit of them goes a long way with flavor in these delicious low fat muffins. 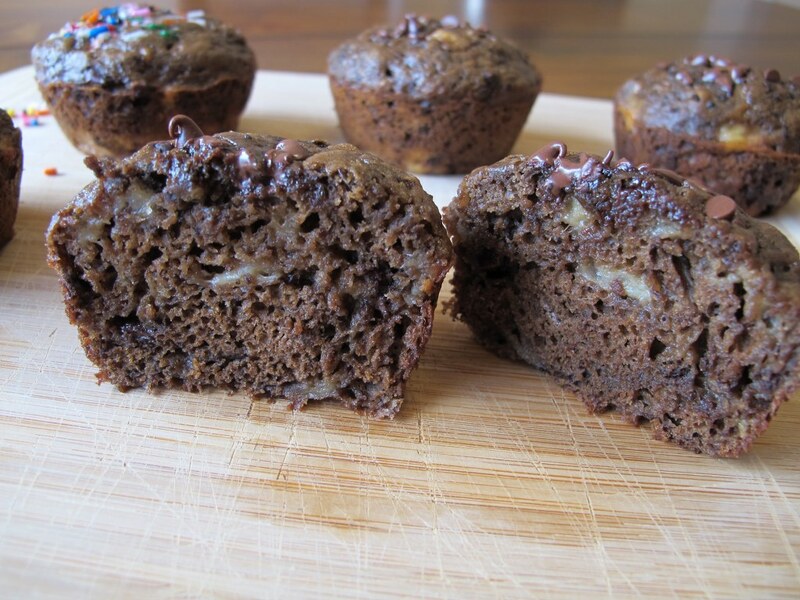 These chocolate banana muffins look so moist and delicious – hard to believe it’s also low fat! I’m getting ready to make some regular banana muffins and feeling guilty that my bananas don’t look quite as ripe as yours! 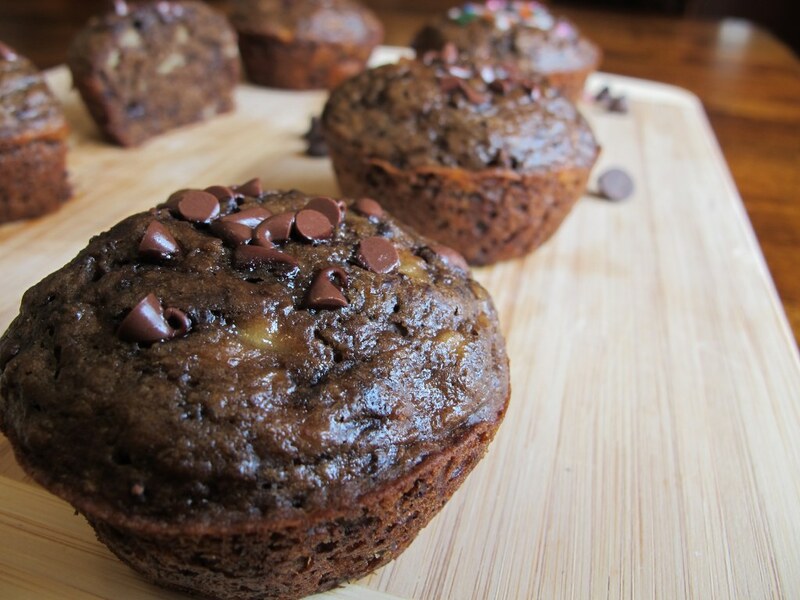 : ) I also love using mini chocolate chips in muffins, too…just discovered that recently when I used them in a chocolate muffin recipe that’s become one of my favs… I have to make that chocolate & banana combination one day! Good luck making your banana muffins. 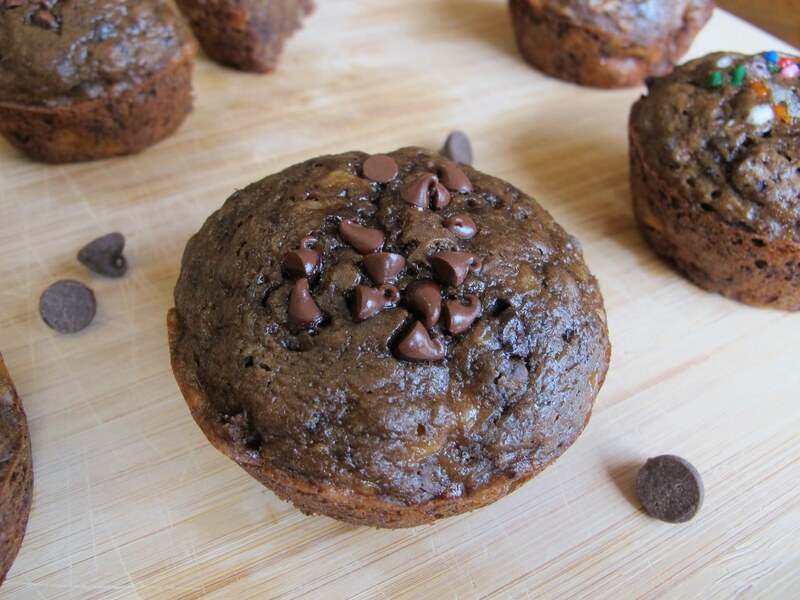 Mini chocolate chips are the best in muffins! I never knew how fun they could be and now they are one of my favorites too. 🙂 Let me know if you end up making these. So good! I love chocolate and banana together. And, of course… any excuse to eat chocolate for breakfast. 🙂 These look wonderful. Chocolate for breakfast always gets my vote! These muffins sound like the perfect start to a day. 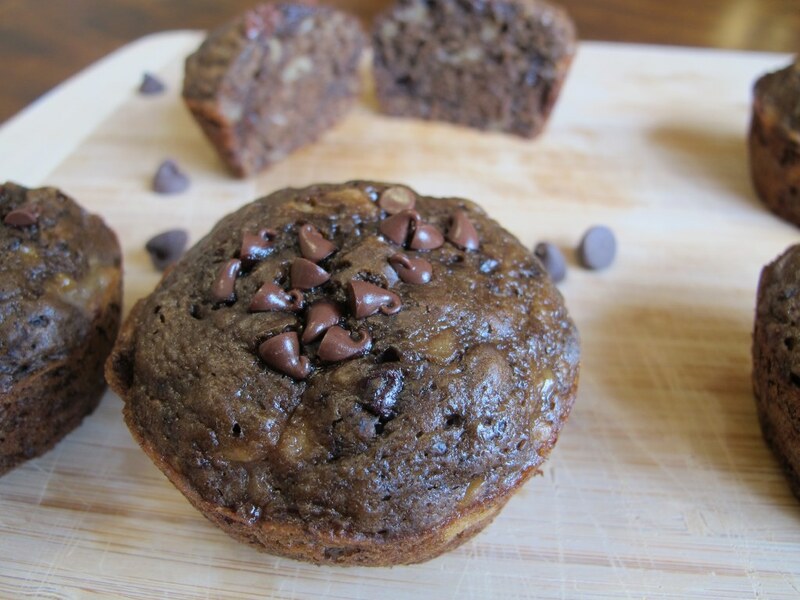 I love chocolate and banana together and am always looking for a new banana muffin! This one totally fits the bill. I’m a recent convert to mini chocolate chips too, they really do add so much flavor for a little bit of chip. 1. I was told that we should always mix the dry ingredients into the wet ingredients to prevent the batter from being lumpy but I notice that you do the opposite. Which method is correct? 2. If I were to add the dry ingredients to the wet ingredients, do I just add bit by bit or just add the entire dry ingredients into the wet ingredients? 3. I was told that I always need to add 1 tsp of baking soda whenever the recipe has banana. Any reason for this? Hi Victoria. I’ve used both methods and don’t fine that one is more correct than the other, in my experience. If you add the dry ingredients into the wet ingredients, I recommend adding a little bit at a time so that you don’t end up with a mess when you go to mix everything together (in other words to prevent the flour, etc from getting all over the place when you stir). I’ve never heard about the baking soda trick so I’m not sure if there is any validity to that or what the reason might be. If you try these muffins let me know how you make out. I check all of the comments, even from posts 3 years ago. 🙂 I really appreciate you stopping by and for the lovely compliment! You made my day! Thanks Tina. I only saw your reply today. LOL. Revisiting this page for muffin baking tips. I just made muffins last week but I used another recipe called Blueberry-Banana Oats muffins where rolled oats are used in place of flour and all ingredients were blended. It turned out surprisingly well. Hahaha.